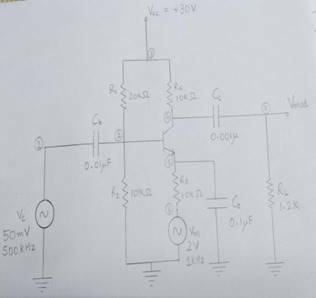 .Considering the difficulties faced by the designer in terms of hardware for designing such systems we have used a system that uses less hardware for this process.We have written the ngspice code for the modulator and demodulator as per the circuit diagram and simulated it in ngspice. In the earlier days amplitude modulation was the simplest technique used for transmission of analog signals. The major advantage that got the designers attention was the simplicity associated with it. Another main important advantage regarding amplitude modulation was that it can transmit signal/message/wave over long distance. So radio channels which are transmits signal worldwide like vividh bharti also uses amplitude modulation. 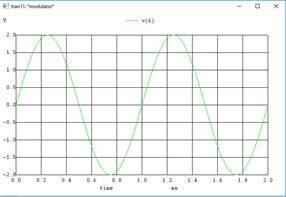 There are different types of amplitude modulation like DSB-FC,SSB, SSB-SC,DSB-SC,VSB. Here we have done simulation using DSB-SC .We have suppressed carrier because carrier doesn't carry any information instead consume power.SSB-SC and VSB are the improvement in DSB-SC as they don't carry carrier with them hence requires less power. They also requires less band width. Modulation is defined as the process by which some characteristics of a carrier signal isvaried in accordance with a modulating signal. The base band signal is referred to as the modulating signal and the output of the modulation process is called as the modulation signal. 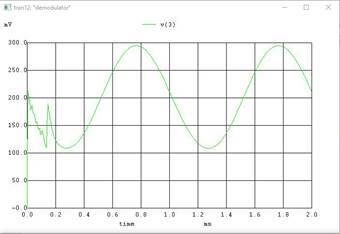 Amplitude modulation is defined as the process in which is the amplitude of the carrier wave is varied about a means values linearly with the base band signal. 2. 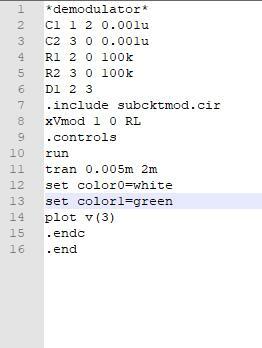 The modulation index must be less than unity. 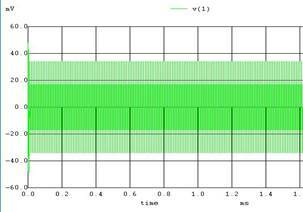 if the modulation index is greater than unity, the carrier wave becomes over modulated. Since Âµ<1, we can obtain the message signal after demodulation without any loss of information. 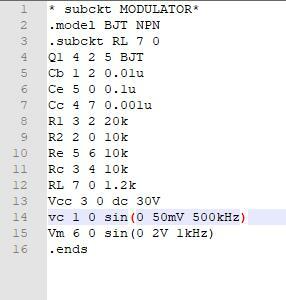 Here we have used Double Side Band Carrier (DSB-C) for modulation purposes. Source called Vm generates the message to be transmitted. It's amplitude is 2V and frequency is 1kHz. The circuit's working principle is as follows: As we can see we have a simple common emitter amplifier topology because of the bypass capacitor Cb connected to the emitter of the transistor, as far as the small signal operation is considered. But the thing is, because we connected the message signal to the branch by-passed by a capacitor, we constantly change the biasing point of the transistor according to our message signal. So we can say that we have a variable gain since the trans conductance of transistor varies. 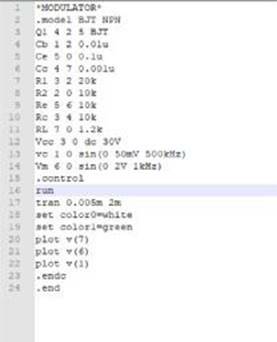 Then we high-pass filter it with the capacitor Cc. The process of detection provides a means of recovering the modulating Signal from modulating signal. Demodulation is the reverse process of modulation. The detector circuit is employed to separate the carrier wave and eliminate the side bands. 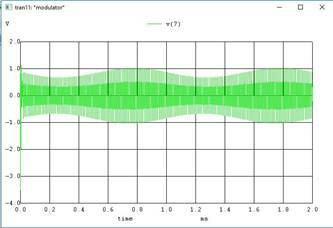 Since the envelope of an AM wave has the same shape as the message, independent of the carrier frequency and phase, demodulation can be accomplished by extracting envelope. The depth of modulation (modulation index) at the detector output greater than zunity(Âµ>1) and circuit impedance is less than circuit load (Rl > Zm) results in clipping of negative peaks of modulating signal. It is called "negative clipping ". With diode D1 and the resistor R2 we half wave rectify the signal. Then with the filter capacitor we try to follow the envelope of the signal. 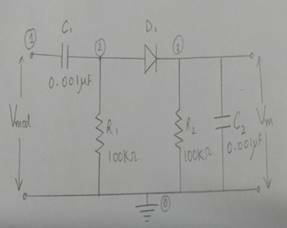 The crucial point when designing this circuit is that we have to choose RC time constant so that, it is not too small to avoid excessive discharges between peaks, and we don't have to choose it too large, to make it possible for the capacitor to follow the signal. The demodulator output is close replica of modulating signal with some approximations considering the noise and limitations of hardware in receiver and transmitor.